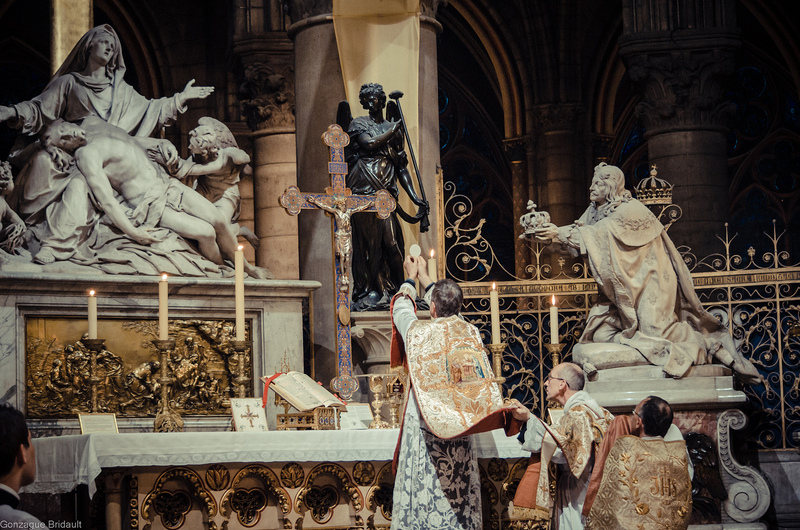 The most recent TLM at Notre Dame, which was Friday of Passion week, was celebrated on the high altar. "Today, too, let us join in prayer with the Christian community of Sri Lanka, which was struck by terrible violence on Easter Sunday. We entrust to the risen Lord the victims, the wounded and all the suffering. #PrayForSriLanka"
At least he said Christian. Mostly other leftists called the murder victims 'Easter worshippers' as though they were adherents of some Anglo-Saxon goddess, perhaps, or just something stops them speaking His name. Yes, this is what it boils down to, isn't it. It's all part of the same old wrong idea that "all councils are infallible", that so many people wrongfully believe is a teaching of the Church. The thing that is really crazy, is that if in fact the Church ever taught that all councils are infallible, which it never did, but if in fact it did, then all trads who reject V2, are sinning because no matter what, we all would be bound to accept V2 as being an infallible council - because that's what the Church teaches, period. But the Catholic Church teaches no such thing. So, as far as trads rejecting V2 while insisting that the Church teaches that all Councils are infallible, what we have here are disobedient people because they reject a Church teaching, proving they have no faith whatsoever in what they wrongfully say the Church teaches. To crawfish out of it, they claim popes are not popes, usually as if they are eyewitnesses to the fact and always as if the Church supports them in this additional wrong idea. How do you know that there was no valid Vicar of Christ to either call or close the First Vatican Council? You mean - how do I know there wasn't no valid Vicar of Chirst at Vatican I, meaning how do I know there was a valid Vicar of Christ at Vatican I? Of course, the same question could be asked of any Council. Vatican I was Catholic and its documents contain no heresies. Therefore we can asssume that a valid Vicar of Christ opened and closed that Council. Whereas, Vatican II wasn't Catholic and its documents contain heresies. Therefore we can, or should, assume that there was no valid Vicar of Christ at that gathering. Catholic Liturgical Life / The prayers of St. Catherine for the Supreme Pontiff. St. Catherine gained great graces for the Pope and the Church, because of her great holiness and her unceasing prayers. She is a model to us of how victories for the Church are won and great calamities averted or mitigated. Let us strive to imitate her in this our own time. O Supreme and Ineffable God, I have sinned! Therefore, I am unworthy to pray to Thee. But Thou canst make me less unworthy. Punish my sins, O Lord, but turn not away from my misery. From Thee I have received a body which I offer to Thee. Behold my body and my blood! Strike, destroy, reduce my bones to dust, but grant me what I ask for the Sovereign Pontiff, the one Bridegroom of Thy Spouse. May he always know Thy will, may he love it and follow it, so that we may not perish. O my God, create a new heart in him! May he ever receive an increase of Thy grace; may he never tire of bearing the standard of Thy holy cross; and may he bestow the treasures of Thy mercy upon unbelievers as he bestows them upon us who enjoy the benefits of the passion and blood of Thy most beloved Son, the Lamb without a spot. O Lord, eternal God, have mercy on me for I have sinned." Catholic Liturgical Life / Re: Divine Mercy devotion: reparation, prayer for pagans and heretics to convert. Our Lord Jesus said, "But Jesus said to them: Suffer the little children, and forbid them not to come to me: for the kingdom of heaven is for such." (Mat 19:14), which shows us it is our right and duty to pray for little children, that they may grow up to be the Saints God wills them to be; as well also for those who may have died in infancy, that the Mercy of God may give them Baptism. Let us offer all those who are little children today to God and ask His Mercy, that they may grow up to be the great Saints of tomorrow. General Catholic Discussion / Re: Pontius Pilate wrote to Tiberius Caesar attesting to the Resurrection of Jesus! Because the Saviour wanted the whole world to know the Truth of His Miracle and Sign that was the Resurrection, since all our salvation begins from the saving profession of that wonderful Truth, therefore He first willed that the fact of His public death be indisputable. We see clearly that early Church Historians had no hesitation in saying that Historians like Josephus (who testifies, in all copies we have, plainly to the Resurrection of Jesus!) Officials like Pilate, and Rabbis like Gamaliel who were contemporaries of Christ or His Apostles attest to His Resurrection or had become Christian, sometimes secretly for fear of others, because of the manifest fact of His Resurrection that had changed their hearts. This is Bp. Eusebius, in Church History: "Chapter 2. How Tiberius was affected when informed by Pilate concerning Christ. The Acts of Pilate are also related in the Gospel of Nicodemus, the converted Pharisee who helped Joseph of Arimathea bury Christ Our Lord. A book does not need to be canonical, divinely inspired and inerrant in order to have historical value and a witness of Tradition. https://www.sacred-texts.com/bib/lbob/lbob10.htm So I hope that answers your objection, SJ. And thanks, Mike, I agree with you. Even minor irritations in my throat can initiate my gag reflex which sends me into a complete panic. I absolutely cannot tolerate gagging. My experience is just a tiny minuscule fraction of your ordeal but nonetheless I can sense the terror that it causes you and you have my sympathies. Just because St. Lawrence was able to face death so boldly does not mean that God requires that of anyone. Its simply that he, for whatever reason, was able to. Some people hurt themselves. Some people gag themselves. Some people have very high tolerances for pain. Some people have very low response to fear or dangerous situations. Other people do not. Others, such as myself, have low tolerance for pain and overreact to threats. My body passes out at the sight of blood and sometimes even the mention of it - been that way since as long as I can remember, never been able to "get over it." It's the way I am. How in the world would Jesus punish me for fainting when it's not something I desire or want to do, but instead suffer my body as I black out? And so too with you. For whatever reason, your body reacts in these terrible ways to these stimuli (as I would too! ), how can God whom is love itself hold that against you? He's not going to judge you for going into a panic that your mind could not get itself out of.